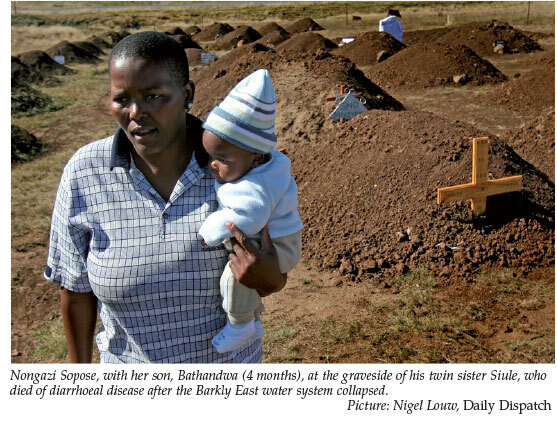 The full extent of the Eastern Cape local government ineptitude and inaction that led to the 80 diarrhoea-related child deaths in the greater Barkly East area by this April has finally emerged amid initial official denial, avoidance and obfuscation. A malfunctioning and decaying water reticulation and purification system in the Ukhahlamba District Municipality (Barkly East, Maclear, Sterkspruit and Elliot), reported in October last year, was only inspected 5 months later after a worried Barkly East money-lender contacted an official. Carol Cronje, of Imali Cash Loans, said an unprecedented number of grandmothers began arriving at her office seeking loans to pay for baby funerals. Later, in a casual conversation with the local undertaker she discovered that he had conducted over a dozen infant burials between January and March this year. 'People often borrow money for funerals, but they never really borrow to bury small children - it was the first time we'd seen it in 10 years,' Cronje told East London's Daily Dispatch. 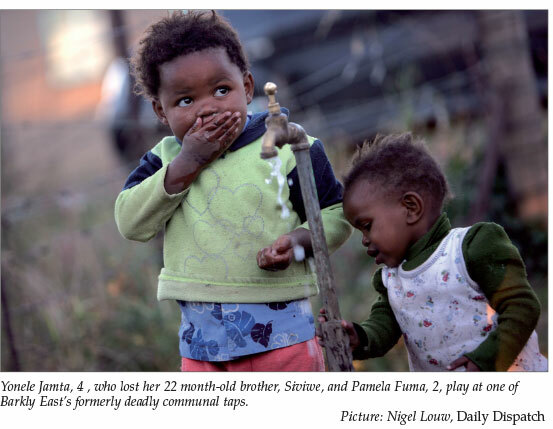 Most of the grandmothers, all of whom sourced their water from communal taps, told her that their grandchildren had died from diarrhoea and were either treated or admitted to the town's Joubert Cloete Hospital. It took nearly a month before Cronje and her daughter read about the growing numbers of deaths in the local newspaper - during which time not a single official public health warning was broadcast. A concurrent lack of mobile clinics and medication in the district hospitals meant medical staff was also unable to properly combat the unheralded diarrhoeal epidemic. The provincial health department promptly pinned the blame on drips the Empilisweni Hospital was using, harking back to earlier multiple infant deaths at the Mt Frere and Dora Nginza coastal district hospitals. At about the same time the Ukhahlamba municipality's health section handed in a report saying the water quality was compromised by malfunctioning infrastructure, with water quality well below standard since October last year. Further proof of the region's dismal service capacity came when electricians from the neighbouring Senqu municipality were given a crash course on water testing and dispatched to Sterkspruit and Barkly East to do daily tests and fit new water pumps and filters at treatment plants. They were instructed to manually add chlorine to the water treatment works and told the Daily Dispatch, 'We did our utmost best but we're struggling with getting the chlorine levels right - you can smell it in the water'. Mr Mxolisi Salmani, site manager for Barkly East's main water pump station and purification centre said the system was crippled by faulty pumps and old filters with silt and dirt collecting at the bottom of the water tanks. Broken pipes aggravated this by keeping water levels dangerously low. An epidemiological report confirmed that the purification process broke down in October last year with water tests revealing elevated levels of bacteria and E. coli from then right through until March this year. The first 15 deaths led to a report, tabled at a closed Ukhahlamba council meeting, recommending the situation be declared an emergency with a wider probe needed. This led to the grim discovery that the baby and child death toll at nearby Sterkspruit was four times worse (62 child or baby deaths). The report found that the Barkly East chlorine pump had broken down and that when chemicals were added by hand, the water was so dirty that they had little effect. Only 2 of 7 boreholes were found to be working and a major pipe was 'exposed' in Zinyoka township, causing reservoirs to run dry. Regional communications manager, Mandlilakhe Zenzile, said when confronted by reporters about the first deaths, 'At this point in time, it has not been established that water was the primary cause of the increase in diarrhoea in the affected areas'. He promised 'appropriate action' if a direct link to water was found, with bleach and soap distribution and a major awareness campaign, which failed to materialise for at least a week. Eastern Cape Premier Nosimo Balindlela, asked why letters requesting mobile clinics, sent from the region at the height of the outbreak, were not responded to, professed ignorance as to their existence. Asked whether she was considering taking steps against her Health MEC, Nomsa Jajula, she responded, 'to be honest I am not one to capitalise on deaths. I am very hurt that children have been hurt and have died. I would like to see a better life for more children. My focus is on the sadness surrounding the death of these children'. A consolidated report with input from the Department of Water Affairs, the district municipality and the provincial and national health departments was finally completed in early May. It concluded that systemic failures affected water quality, there was insufficient health education, especially at household level, that service delivery 'inadequacies' led to infrastructure and human resource backlogs and that there were inadequate fluids and antibiotics to deal with the added demand. Poverty and 'socio-economic factors' were also blamed. Recommendations were that water quality and monitoring of compliance be 'collectively' addressed, the social cluster of the province and all departments support the Ukhahlamba Municipality and that public education and civil service training be intensified. The department of health promised to 'analyse the status quo' across the entire province to ensure the tragedy was not repeated.